Obama and Trump were offering competing visions for the country in a split screen of campaigning on Sunday, seeking to galvanize voter turnout in the fight to control Congress and governors' mansions. 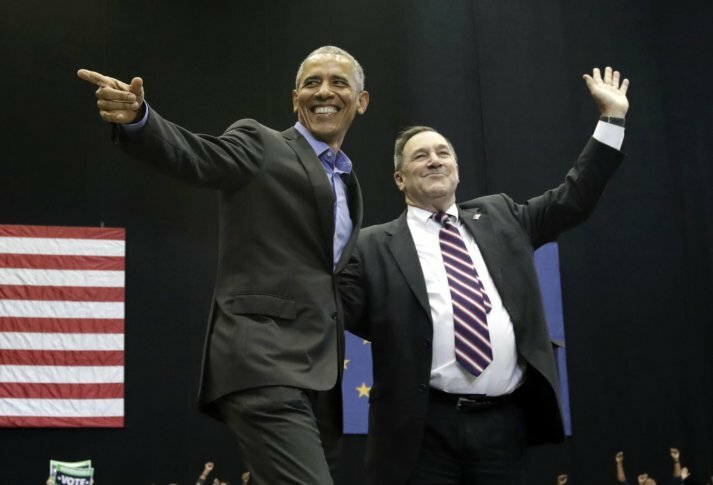 Obama rallied Democrats in Gary, Indiana, on behalf of Sen. Joe Donnelly, D-Ind., who faces a stiff challenge from Republican businessman Mike Braun. Later in the day, the former president campaigned in his hometown of Chicago for businessman J.B. Pritzker, Democrats’ nominee for Illinois governor. In Pennsylvania, a hoarse former Vice President Joe Biden accused the Trump administration of shredding the nation’s “moral fabric” and a GOP-controlled Congress of waging a broad war on middle-class protections, from health care to Social Security. Democrats, he said, must take back the country to reset the nation’s moral compass. Biden traced a line from the mass killing in a Pittsburgh synagogue and the slaying of two black shoppers at a Kentucky grocery store last month to Trump’s remarks after clashes between white supremacists and counterprotesters in Charlottesville when he blamed both sides for the violence. Associated Press writers Jill Colvin in Washington, Zeke Miller in Macon, Ga., Marc Levy in Harrisburg, Pa., and Sara Burnett in Gary, Ind., contributed to this report.